The important crossings from Italy to Greece have now been announced, and are open for booking. As the most popular way of bringing a car or caravan over to Greece, these tickets sell out fast. Most cabins and vehicles are sold out by April. So, if you are interested in catching a ferry from Italy to Greece (or vice versa) don’t leave it too late! 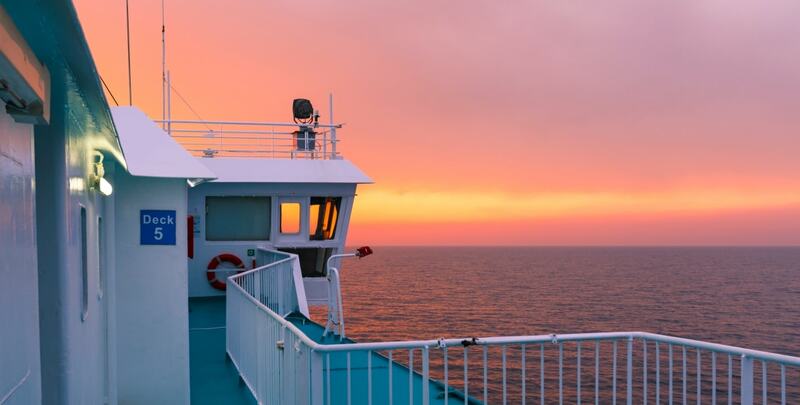 The ferry itineraries from Ancona to Greece up to December 2019 have been announced by the two ferry operators that serve this route i.e. Minoan Lines and ANEK Lines - Superfast Ferries. 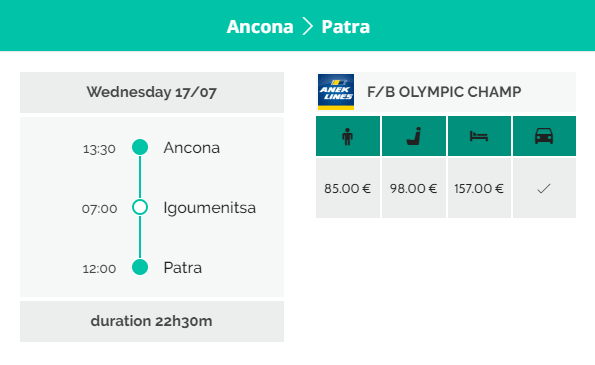 ANEK - Superfast serves the route from Ancona to Igoumenitsa and Patras with one or two daily ferries Olympic Champion, Superfast XI and Hellenic Spirit. On the other hand, Minoan Lines (a Grimaldi Group company) is serving the route from Ancona to Igoumenitsa and Patras six days per week (all days except Tuesdays) through the ferries Cruize Europa and Cruize Olympia. You can use our ferry booking engine to consult schedules, find the itineraries that suit you and book your ferry tickets simply and safely. Minoan Lines offer a special 20% discount for bookings made before the 28th February 2019, for travel up to the 15th January 2020. It’s great to know that this discount is cumulative with any other discounts usually offered (student, pensioner, etc), but it’s important to remember that tickets which benefited from Early Booking discounts cannot be cancelled. You can always change these tickets, but any alteration after the 28th February cut off dates would mean that you lose the discount on the altered leg, and would have to pay the difference. There are a limited number of Early Booking tickets available, so these could run out before the stated cut-off date. Make sure you book early to get the cheapest ferry ticket! The ferry itineraries from Venice to Greece up to December 2019 have been announced by Minoan Lines and ANEK Lines - Superfast Ferries. Minoan Lines is serving the route from Venice to Ancona, Igoumenitsa, and Patras twice a week (Tuesday and Wednesday) through the ferries Cruize Europa and Cruize Olympia. 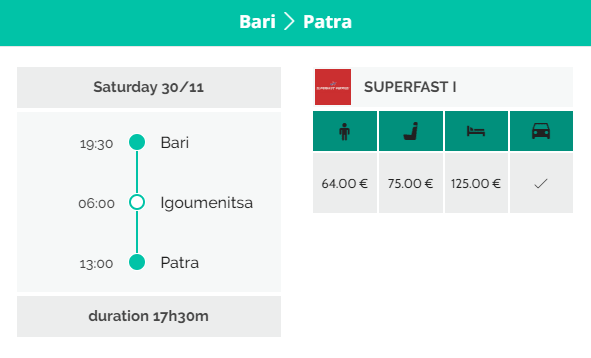 On the other hand, ANEK - Superfast serves the route from Venice to Ancona, Igoumenitsa and Patras on Wednesdays, Saturdays, and Sundays (only during the low season) through the ferries Asterion II and Hellenic Spirit. You can use our ferry booking engine to consult schedules, find the itineraries that suit you and book your ferry tickets simply and safely. Both companies support the early booking discount for the trip from Venice to Greece, as this is described in the Ancona to Greece section. Superfast Ferries has announced the itineraries for the season of summer 2019, up to the end of December. The main route is from Bari to Patras via Igoumenitsa and sometimes Corfu. The route is served by the ferries Superfast I and Superfast II, that will definitely provide you a relaxed and enjoyable trip. You may find the all the available ferry tickets for this route through Ferryhopper's booking engine. How do I book ferry tickets from Italy to Greece? 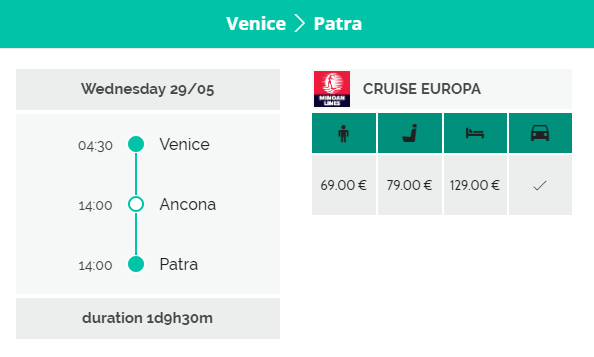 You can find all itineraries and book ferry tickets at the best prices for the ferries that serve the route from Italy to Greece our Ferryhopper's ferry booking engine!